Total Systems Heating & Cooling, Inc. is a corporation of two people that have merged together. Jerry Hall and Brenda Wright-Hall have been serving their community for over 30 years. Their goal is to provide the community with quality service at a reasonable rate. Jerry Hall was born and raised in Hope Mills, North Carolina and graduated at South View High School in 1979. Jerry has continued to serve the community in many different fields such as HVAC, Refrigeration, Electrical, Maintenance, with over 20 years' experience. He has been in business for himself since 1998 until present; merging his company to form Total Systems Heating & Cooling, Inc. Jerry Hall is the Vice President of Total Systems. Brenda Wright-Hall was born in California and moved to North Carolina 15 years ago. She has worked in the Communications Business for most of the 20 years on phone systems and Fiber Optics. 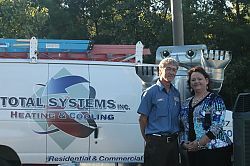 She retired from the Communications field to Start Total Systems Heating & Cooling, Inc. with Jerry Hall. Brenda has been working with customers most of her career and enjoys having her own business. Brenda Wright-Hall is the President of Total Systems.